Rationalist Judaism: I Can't Believe It's Not Treife! Notwithstanding the vast range of kosher foods available today, keeping kosher sometimes seems limiting in terms of the actual species that we can eat. I remember staying at a lodge in Zimbabwe, where the other guests were eating ostrich burgers, crocodile steaks and grilled warthog, whereas the participants in my group had to settle for chicken and beef. And while the species that are available to the kosher consumer are strictly of the mammalian, avian or piscine variety, if you go to the market in Bangkok, you’ll see people munching on all kinds of grub—literally. Still, the truth is that there are many more kosher species than is commonly assumed. A few years ago, at the Biblical Museum of Natural History, we decided to prepare banquets that were not only delicious, but also educational, and very special from a kashrut standpoint. Inspired by the trailblazing work of our colleague Rabbi Dr. Ari Zivotofsky and Dr. Ari Greenspan, we decided to see how far we could take this idea. These events are enormously complicated, stressful and expensive to produce, but they are unique educational and cultural experiences! Our first banquet at the museum, two years ago, was a Feast of Biblical Flora & Fauna. This featured species that we see in the Torah were consumed, but that are not normally eaten nowadays. Thus, there was no chicken—chickens are not mentioned anywhere in Tanach, since they were domesticated from Indian jungle fowl, which had not yet reached the land of Israel in the Biblical period. Instead, we served species such as doves, quails, geese, goa and deer—which was served daily at King Solomon’s table, but which is almost impossible to obtain (under kosher certification) today. Dessert was, of course, chocolate-covered locusts. The Torah states that certain locusts are kosher, and various North African and Yemenite Jewish communities retained the tradition as to which species is kosher—namely, the desert locust, Schistocerca gregaria. Eating locusts is not a relic of a primitive era; locusts are considered by food nutritionists to be the super-food of the future. They are high in protein and very nutritious, although that benefit is lost somewhat when they are coated in chocolate. The Feast of Biblical Flora & Fauna will be repeated in Teaneck in October, though there is not yet any guarantee as to exactly which species will be served, since the shechitah of unusual species can be even more complicated in the US than in Israel. This year at the museum, we have decided to do something different yet again: A Feast of Legends From the Sea. This includes several different types of dishes. First of all, despite the name and theme of the event, the feast is not pareve—there are two unusual fleishig items on the menu. But everything served is on the theme of “Legends From the Sea.” And all fishes are pareve. So how can we be serving two “Legends From the Sea” that are fleishig? That’s a riddle that can be answered with knowledge of some commentaries on a certain verse in the Torah. It would be a pity to spoil the riddle, so we will publicly reveal the answer after the event. A second type of dish relates to species that are popularly believed to be unequivocally non-kosher, but that are actually kosher—at least according to certain significant halachic opinions. There are a number of species that fall into this category, some (but not all) of which we shall be serving, including sturgeon, swordfish and piranha! Then are the dishes that are based on the Gemara’s fascinating statements that there is nothing inherently unappetizing about non-kosher food, and that for every non-kosher food, there is a kosher equivalent. Kosher “crab” has been available in supermarkets for a while already. But we are taking things to the next level, with foods that not only visually look like the more exotic seafoods—complete with shells and tentacles—but that are even made with them! Now, how is that possible? Well, let us first consider our planned dish of Cephalopod Salad. Cephalopods are the class of molluscs that includes octopus and squid. They are surely all non-kosher, as treife as treife can be. And yet, there are actually theoretically not one but two ways of serving a kosher tentacled dish that is actually made with real cephalopod! One involves a unique species of cephalopod called the Grimaldi squid. Contrary to popular belief, the Torah does not say that a sea creature has to be a fish in order to be kosher. It only speaks of “anything that has fins and scales.” And, uniquely among cephalopods, the Grimaldi squid actually has fins and scales. However, this is not the way that we are serving cephalopod. First of all, while some authorities are of the view that any scaled and finned aquatic creature is kosher, Rambam and others maintain that it must be a fish. Second, in any case, Grimaldi squid are impossible to obtain—only a few individuals have ever been discovered. And so we have devised a different way of serving cephalopod. Without giving away too much in advance, the halachos of kashrut include some fascinating concepts, including that not every part of every non-kosher creature is itself non-kosher. 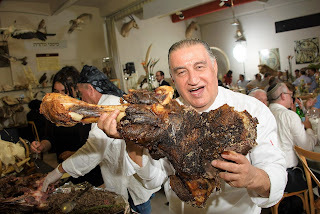 Certain parts of some unusual non-kosher creatures are simply not considered to be the “meat” of the creature, and thus may be eaten. And so, with the aid of an obscure halachic ruling in this vein, the knowledge of a particular unusual species, together with a specialized item from Japan, we plan to serve something that not only looks like cephalopod—tentacles and all—but is even made with cephalopod! The world houses an astonishingly diverse range of marvelous creatures, and halacha encompasses a remarkably wide variety of kashrut scenarios. The combination of the two is enlightening—and delicious. Rabbi Dr. Natan Slifkin is the founder and director of the Biblical Museum of Natural History in Beit Shemesh. For extensive discussion about kosher locusts, see www.BiblicalNaturalHistory.org/locust. For more details about the Feast of Biblical Flora & Fauna in Teaneck, and the Feast of Legends From the Sea in Israel, see www.BiblicalNaturalHistory.org/feast. Isn't there a Chazal that the Torah did not instruct chickens to be used for korbanos because they are promiscuous? They don’t appear in Tanach because they are not relevant. Just because something existed at the time does not mean it was meaningful. Chickens, even if not common, would have had to been part of daily life in some capacity for there to be any reason to mention. There is no list of kosher birds in the Torah - just those that are non kosher. So no need to mention chickens. Certain kosher birds are mentioned in the context of korbanot but those are prescriptive so if chickens are not brought they are not mentioned. Birds are also mentioned in Navi and Ketuvim and if chickens were not part of the relevant experience which is being discussed why would they be mentioned? Also, the link you provide does not indicate the evidence was in Israel. Moreover, it mentions an absence of evidence somewhat around the time of Tanach. Hence it seems if they were present it certainly was rare and uncommon and “dibra Torah k’lshon b’nai Adam- Torah uses readily accessible human experience. Does the mention of cephalopods and "certain parts" being kosher mean that you're serving pasta with squid ink sauce? Are there communities that accepted Sturgeon as kosher? 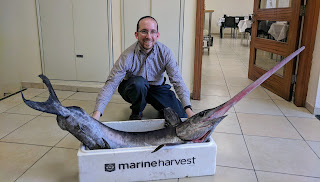 Yes, Rav Natan, if Sturgeon is kosher how come no one certifies smoked sturgeon, or their caviar which is delicious, as kosher??? The Noda' biYhudoh paskened explicitly that sturgeon is kosher. Most hashgachos have chumros beyond the letter of the halochoh, though, so you won't find hechshered sturgeon, unless you make it yourself. May I suggest coating the locust in a thin layer of Stevia dark chocolate? I was in aquaculture biz for a decade. I studied the swordfish issue in depth. Turns out, while true baby swords have scales, which is the basis for the heater, it turns out those scales are of the subderal, "bony" type which means they are not real scales, not in scientific nor halachic terms. Yes. The scales are halachically valid. lol!! are you going to explain how, or are we to take your word for it as you are a leading haachic expert? What is the sources that scales like these are kosher? They are not removable without tearing the flesh. Is Rav Machpud a good enough source for you? Was told by a talmid of RHS that RHS told him he was misquoted in the interview. I have no horse in this race- just repeating what I was told. Rabbi Tendler gave a lecture recently (should be one of the most recent from him on yutorah.org) in which he (to put it mildly) strongly rejected Rav Schacter's presentation of his (RMDT's) position. The phrase "shigegas talmid oleh zadon" was used. He is of the opinion that the swordfish is absolutely nonkosher. I'm just pointing this out for clarity, not taking a side. Legit question (ie not a mock or a dig or a hey-look-you're-not-frum), as I would love to be there and eat: it sounds as if for some things, the Feast will be relying on obscure shitos, not mainstream-approved-but-little-used mesorah. Is it not inappropriate to go out of our way to find these opinions and then rely on them if it is not a sha'as had'chak? ie to say we can eat quail is fine-it's special simply bc it's not used much in the modern West - but should not the hetter to eat a cephalopod component be limited to those poor dwellers of the shtetels of Polynesia? It's not relying on obscure shittos which go against the mainstream. It's relying on mainstream halacha that is little known. There's a big difference. In addition to what RNS answered, would note that much of the Mishna Brurah itself consists of obscure shittos that hitherto were not known and not followed in practice. Its like wearing Techeles, or walking to shul with your tallis on. Supporters point to the supporting sources, Critics point to the opposing sources, then cry חדשים מקרב באו and tailor the accusations to fit the context. R' Slifkin, the dispute about the kashrut of sturgeon, if not also swordfish, is old. It is a question of whether discrete boney knobs on the skin can be subsumed under the term kashkeshet of the torah, or not. The evident meaning of kashkeshet, however, is like the armor of the same name, a covering of scales. As I recollect, that was the view of the Ramban. The knobs of the sturgeon and the juvenile swordfish would therefore not be the required kosher siman. Why would Rav Machpud and, possibly, Rav Schachter permit it, and why would you and your colleagues be anxious to interject yourselves into this issue? In general, I find it distasteful to provide a meal of something that is made to resemble a treif food, or to even be called by that name. I personally will not eat 'kosher bacon', Facon, or even Bacos. The same is true for something labelled 'kosher crab'. It's a question of avoiding the implication that the torah significantly diminishes the enjoyment of life with its restrictions. "Why would Rav Machpud and, possibly, Rav Schachter permit it"
Because they checked the scales and found them perfectly valid. "It's a question of avoiding the implication that the torah significantly diminishes the enjoyment of life with its restrictions." But Chazal explicitly address this and speak about kosher foods that taste like non-kosher foods. Your point is something I brought up in connection with the dateline. Is it correct for a man in the street, when faced with a clear sofek d'oreysah, to be machria in a machlokas haposkim between heavy weights on either side. Unless maybe he has a respective rov who told him he can lechatchila rely on the me'kilim. Most rabbonim I know would state they don't have the power to machria. It's not like there is clear pressing need to eat swordfish. If there was, it would be a different story. R' Slifkin, we should feel free to disregard the judgment of those rabbonim especially if their rationale is either unknown or unconvincing. They aren't in the category of a R' Moshe or a R' Shlomo Zalman that their views have authority. Furthermore, argument from authority, especially if it flies in the face of traditional views, has little impact on the more rationally minded observant Jews. If you have read such rationales on the permissibility of sturgeon and swordfish kindly post them and let us judge for ourselves. Whether or not there are always kosher varieties that taste like all the treif foodstuffs is besides the point[it is highly unlikely in any case]. The point is not that one shouldn't eat something kosher that tastes like a treif analog. There is likely no distinction in taste between a kosher and treif beefburger. The point is that one shouldn't prepare a kosher foodstuff so that it resembles an obviously treif item. That has nothing to do with taste but with the mental fiction that one is really eating the appealing treif item. "we should feel free to disregard the judgment of those rabbonim especially if their rationale is either unknown or unconvincing." It is neither unknown nor unconvincing. It's direct personal testimony. Moreover, it is consistent with traditional views, not against them. The Torah allowing eating Locust was a great Idea. They can cause wise spread agricultural damage, turn a problem into a solution - feeding us. My guess is people in the region have always been eating them so the Torah could not prohibit a good source of food. Thus the Torah sanctioned it. Do we need to eat exotic foods? R Slifkin, thank you for this article - would you mind sharing which sources write piranha are kosher? I heard the same and wanted to prove it to others via the sources themselves. Thank you!